The sea can be a mystical, wondrous place. The creatures that swim in the waves can capture a child's imagination. The book, Whaley's Big Adventure, shares the journey of a whale meeting other whales in the open water. 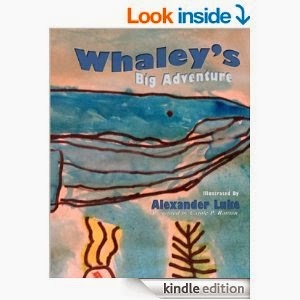 Whaley's Big Adventure is a perfect book for a school aged child who prefers non-fiction over fiction. This book balances a fictional premise with educational information. As Whaley travels, he meets several types of whales. From Orcas to Beluga, Whaley shares several facts about each type of whale. The book is informative and entertaining. Written by a child, the voice of the book appeals to children. The story is descriptive yet easy to read. Both school aged-readers and pre-readers will enjoy the story time and time again. Would you like to add Whaley's Big Adventure to your library? Please use the Rafflecopter to enter.